For home addition contractors you can trust to take on a project at your home in Hilton Head, South Carolina, turn to Porch Outfitters. The work we perform is superior to that of our competitors because we only build custom additions – not modular products – and have been doing so for nearly 30 years. This means that, no matter what kind of addition you want for your home, such as a garage, in-law, suite, or new bathroom, you can trust that we’ll build it according to your unique requirements. 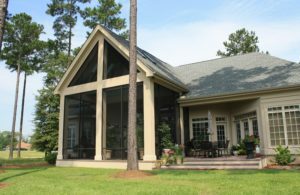 As highly experienced home addition contractors serving Hilton Head, SC, Porch Outfitters is the best company to turn to for sunroom additions. These products come from the trusted manufacturer TEMO, and provide homeowners with an excellent way to enjoy the beauty of the outdoors all year long without having to worry about harmful UV rays, pesky insects, or inclement weather. Plus, TEMO sunrooms are built with energy efficient materials, making it easy for your HVAC unit to maintain comfortable temperatures throughout the year. To learn more about what makes us the finest home addition contractors serving Hilton Head, SC, contact Porch Outfitters today.